Daniel Ricciardo believes he could land pole position for Sunday's Hungarian Grand Prix after he set the pace in both of Friday's free practice sessions. An update to the RB13 saw Ricciardo, the winner of the race in 2014, a surprise name at the top of the timing sheets for FP1. But far from a fluke, the Australian topped the times in FP2 as well, improving to a 1:18.455 - nearly two tenths ahead of championship leader Sebastian Vettel. And given the pace of the Red Bull on Friday, Ricciardo hasn't ruled out a shot at pole position. “If we replicate today then yes," he said when asked if he could land top spot again. “Today was good, certainly it was a positive day. “To replicate the same pace as this morning in the afternoon is positive gives everyone the chance to make some changes. 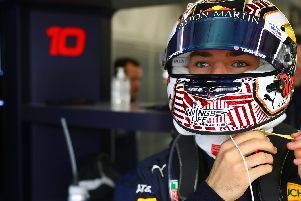 Max Verstappen was just half a second back of his team-mate in FP2, but set the sixth fastest time behind both Ferraris and Mercedes cars.